The Light Edition Kit is ideal for the space conscious wordsmith. With around half the amount of words as the Ultimate Edition Kit, it is actually a subset of the best and most frequently used words. Excellent for leaving personalized messages, keeping lists of your favorite items or expressing yourself through unique statements. Big fun in a small package, you might even have room on the fridge for a photo of Grammie! Includes many "basic" words like: the, of, and, you, that and with. Includes many "practical" words like: call, remember, laundry, milk, meeting, feed, walk, and dinner. Includes "poetic" words like sparkle, magic, cloud, dream, terrible, and peace. Also contains all the days of the week, two sets of numbers (0-9), times (:00, :30), word fragments and punctuation, including math, smileys and currency symbols. Black type on white background. 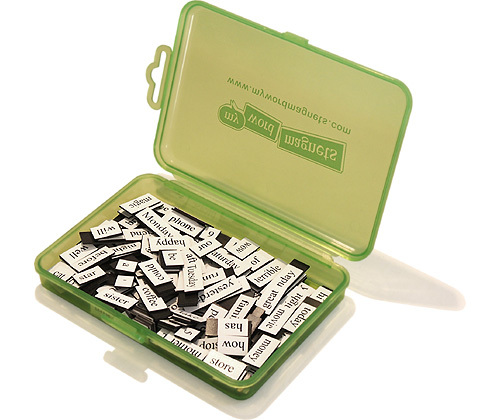 Each word magnet is approximately 3/8" high (9.5mm), width varies, and is a full 1mm thick! Your words will be printed as black type on a white background. Includes super strong poly-propylene box with a unique locking clasp for convenient storage (5.5" x 4" x 1"). Warning: Contains small parts, may present a possible choking hazard for babies. Not intended for children under 5 years old. Your words are "Case-Sensitive" and we do not correct spelling. We reserve the right to refuse any order that we consider to be inappropriate. See Legal Terms & Conditions for more details.